According to Ayurveda, hair type is directly related to body type and is systematically classified into three categories: Vata, Pitta, and Kapha. Hair loss is caused because of Pitta Dosha. Pitta governs our metabolism and digestion and it controls our general wellbeing. Bad eating habits, anxiety, and stress cause Pitta Dosha, which leads to hair loss. Excessive consumption of tea, coffee, alcohol, and meat, fried and spicy food can cause an imbalance in pitta. Bhringraj: It is a king of herbs, it helps promote hair growth and also reverses balding. It can also use to prevent premature greying. It is available in a powdered form and in an oil form. You can also use fresh leaves of Bhringraj, blend them to get a consistent paste and apply it on scalp for 20 minutes and wash off with shampoo. Use this remedy thrice a week. Amla: It is called as The Indian Gooseberry, it an effective solution for hair fall, purifying blood and treating indigestion. Take 5-6 tablespoon amla powder in a bowl and mix in water to make a thick paste. Apply it on your scalp and leave it for 30 minutes and wash off with shampoo. Use this remedy thrice a week. 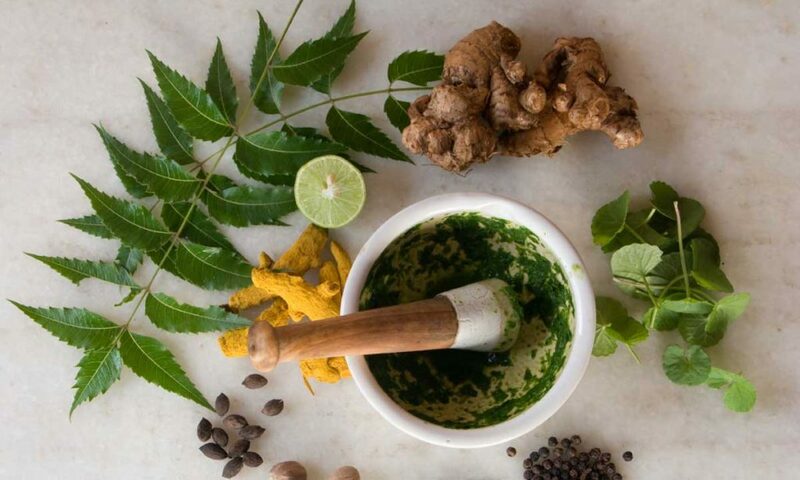 Neem: Regular use of neem on the scalp improves blood circulation and strengthens the roots which promote hair growth. It is also used to treat dandruff and lice. Boil the neem leaves in water for 15 minutes and then set it aside to cool. Once the solution is cool, strain the liquid and use that water as a final rinse. Use it thrice a week. Ritha: It is called as Soap Nuts and it is a natural shampoo. It promotes hair growth, improves texture and volume. Take a handful of Soap Nuts and soak it overnight in 2 cups of warm water. In morning, boil the soap nuts in the same water for about 15 minutes and then set it aside to cool. Strain the cool solution and then first rinse your hair with water and then pour half of the soap nut solution through your hair. Massage your hair for 5 minutes and then rinse with water. Repeat it with the remaining soap nut shampoo. Use it on alternate days. Shikakai: It is rich in antioxidant so it is perfect for restoring health and treating hair fall. It detangles the hair, reduces dandruff and conditions hair to make it luscious and manageable. Take about 6 tablespoons dried Shikakai powder and mix it with 2 cups of water. Rinse your hair with water and then pour half of the Shikakai solution through your hair. Massage your hair for 5 minutes and then rinse with water. Repeat it with the remaining Shikakai shampoo. Use it on alternate days.